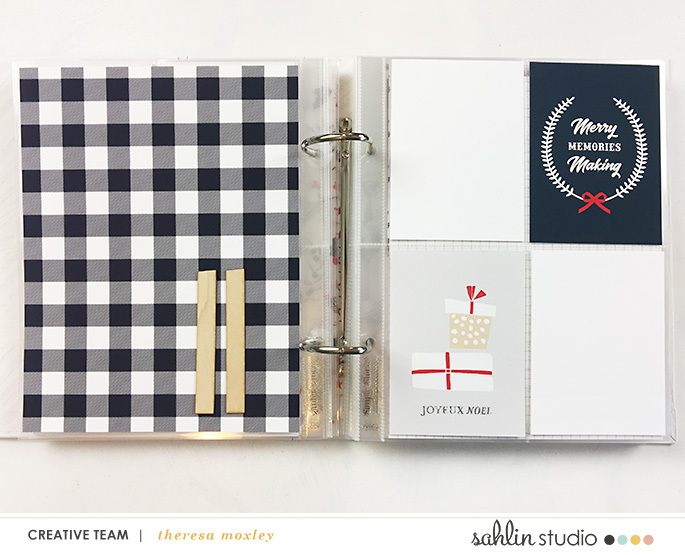 Hi everyone, it’s Theresa here of Larkindesign, and welcome to Document Your December 2017. I am so excited every year to participate in this project and especially thrilled to share the completed project with you. 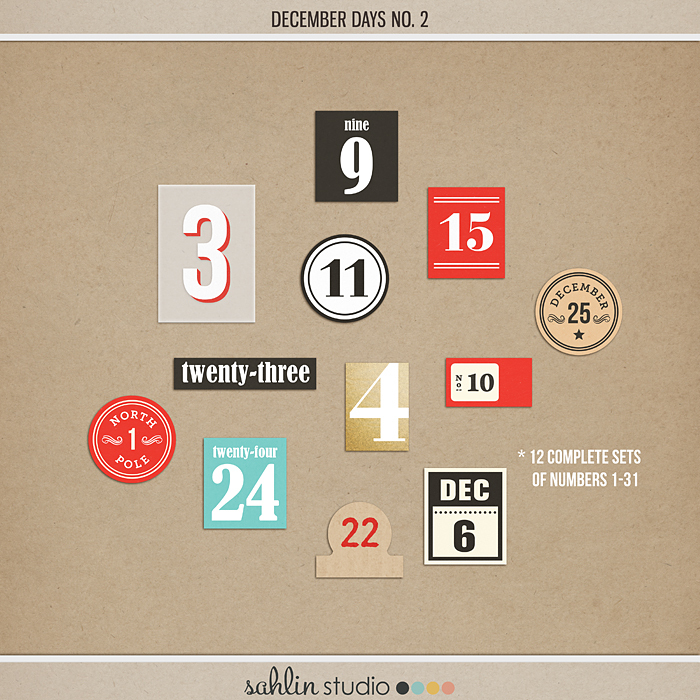 What is Document Your December or December Daily? This is an album project designed to inspire you to photograph and document your December memories. 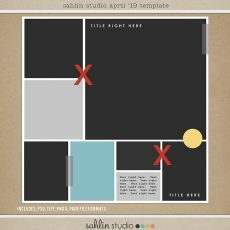 I chose a daily format with 25 entries or layouts, in a 6×8 pocket page album. 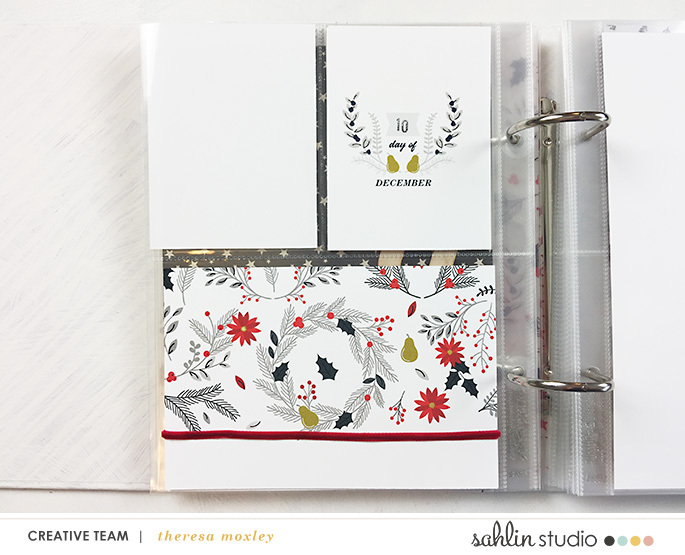 I’ve used several different products from the Sahlin Studio collection, including Making Spirits Bright, December Kit plus Journal Cards, and December Days No. 2. Each year, in the month of November, I begin my process for this album by creating Foundation Pages. You can read more about my approach to these pages in this post here. I am always so happy to start December with a prepped album and camera in hand! For Day 4 we went to our local tree stand to get our beloved Christmas tree. This is of course one of our favorite traditions, and I have chosen two photos to help me tell this story. 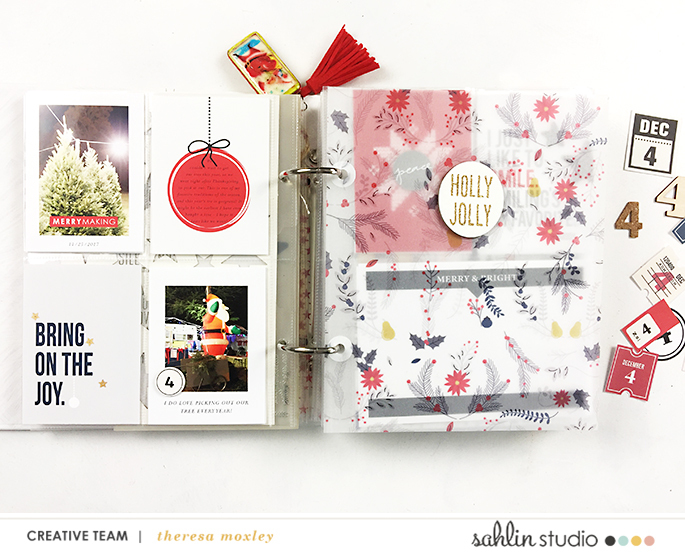 The journal cards from the December kit are great for telling all your favorite stories, and here I have re-printed the ornament card to include my journaling. The photos were printed using the Pocket Guides No. 2 from Paislee Press. 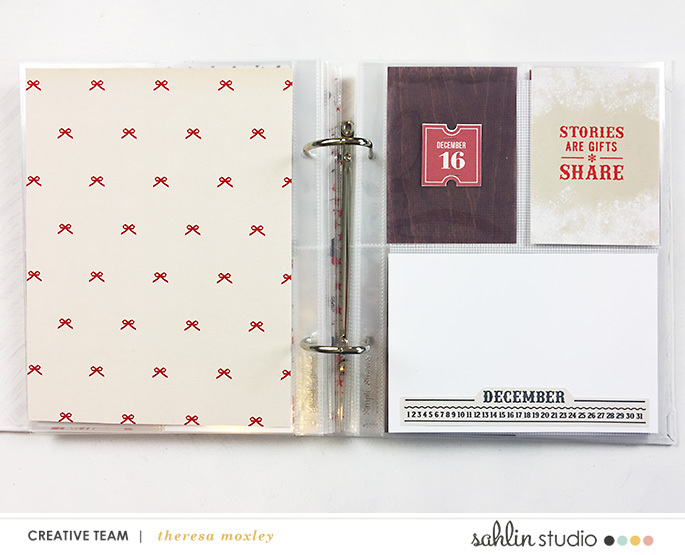 The vellum is actually a printed patterned paper from the December kit. 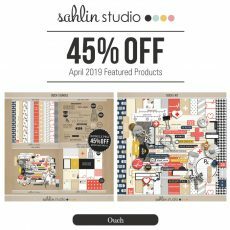 This pattern is perfect for adding a bit of beautiful color and visual interest to the layout! Day 5 begins with the back of the lovely vellum. Since a tiny bit of the chipboard shows through, I added the number 5 on this side. That 5 is part of the December Days No. 2 kit, which has so many awesome choices for numbers! The journaling cards were perfect just the way they were. My story for this day was a simple photo of our home with the lights hung and you can even see the moon up above it. This is what I call an iconic photo for me, because it is a photo I like to take throughout the year to document our home as the seasons pass. Notice how I changed out the 4×6 card here. I had originally planned to print my photo onto the journal card but since it was a dark photo the banner disappeared against it. No worries, the banner is also an individual element in the collection and it happens to be red, which contrasts beautifully against my photo. My journaling is added onto a tag that I have tied into the album using a tiny red ribbon. For my Day 10 I had repeated that beautiful branch pattern from the December kit, and I added a title to that card using some letter alphabet stickers and stamps. My photo and story for this day are a letter to myself of sorts. Do the holidays ever make you feel somewhat melancholy? They do me, usually once everything is decorated I get a little sad that at the end of the month it will all be over and taken back down! So I wrote myself a little letter reminding myself of the important things in the holiday that will remain long after the lights and garlands are gone, long after the gifts are unwrapped and put away: the love and the relationships we are sharing these holidays with. I love this project simply because it allows me the space to focus on what is truly important here. Day 11 was once again all about lights and favorite traditions: going to see the lights at Tanglewood Park, located in Clemmons, NC. We go every year, and I never ever get tired of seeing them every year! 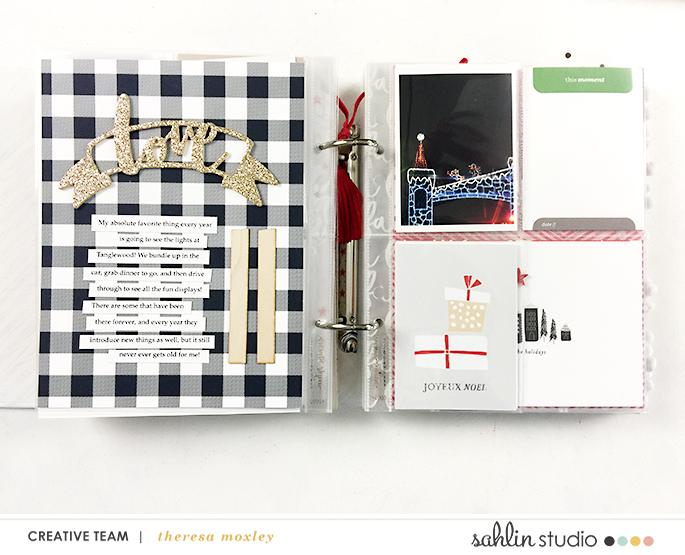 I must fully disclose that I wasn’t entirely happy with the photos I took that night, so I kept them small and let the journaling page take center stage! I’ve used that gorgeous navy buffalo check as the backdrop and added a glittery title from Amy Tangerine. I printed my journaling onto strips of paper and created the number using Elle’s Studio wood veneer 1’s. Day 16 got a little facelift where I changed out the full page on the left hand side for a little plastic envelope the day before. That pocket holds our children’s wish lists, and then my actual story for this day is about being sick. I had a yucky cold for a few days and had kept on going (right, isn’t that how we mothers do?!) but even though I kept going I did take some down time to grab naps and rest when I could. As I was making the bed I reflected a bit about how our bedroom had been a sanctuary for me and so that became my story for the day. My photo is just of my side of the bed, and a tiny bit of journaling to explain. Notice again how I replaced the original journaling card with the photo and then used the decorative element from that card to embellish my photo. The most exciting part, of course, to completing this project, is filling in the photos and stories for Christmas Day! When I created my foundation pages I simply printed and embellished a few cards and placed them in the pockets knowing I would be adding more pages after the fact. Once I downloaded and printed my photos, it was fun arrange them how I wanted and fill in with those cards. 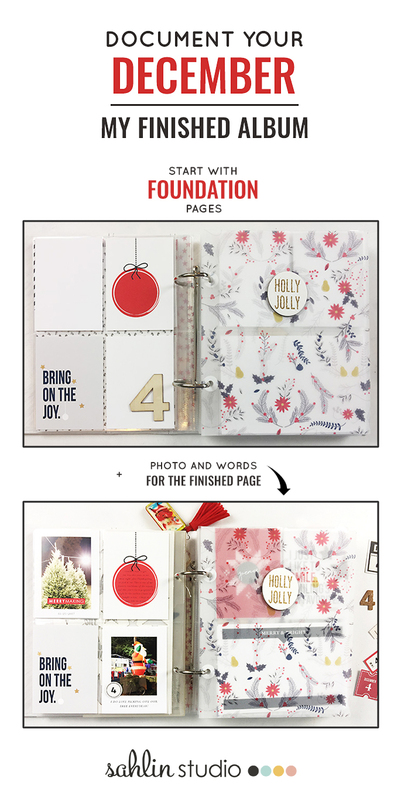 For the full page on the left, I printed a portion of the patterned paper from the Making Spirits Bright collection and layered it onto the neutral paper. The wood veneer tree is a Target find! I love including several pages from the big day. I want to be sure to include at least one photo of each of us opening presents, and I like to tell the stories of what was significant about this year. For us, everything was about the fur because everyone got some sort of gift that had fur, fur vest, fur pillows, fur blankets! We also had two incidents where the presents were hard to open and the kids just ripped into the boxes. What awesome memories, and the journal cards here are perfect for telling those stories. This is such an amazing project and I am so thankful that I have taken the time to photograph and document these stories in this way. Thank you for following along with me! 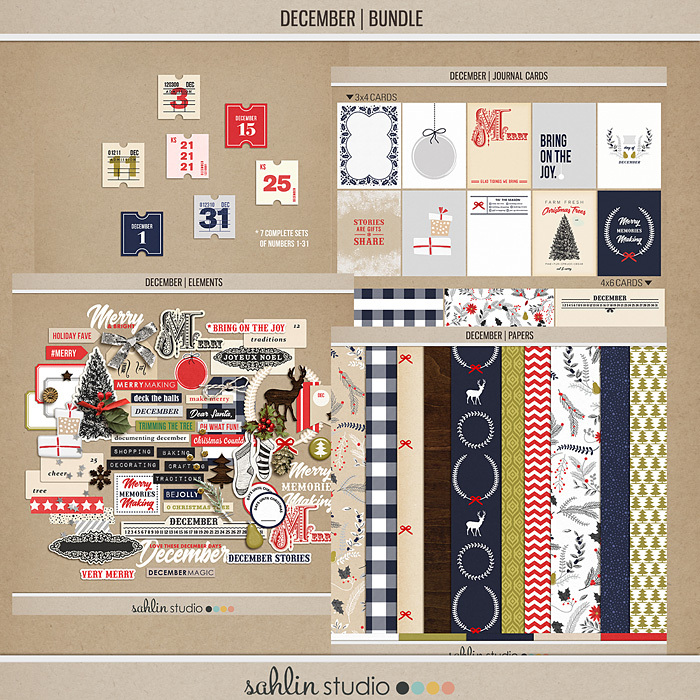 Products used in this post: Sahlin Studio December Kit and Journal Cards; Sahlin Studio Making Spirits Bright Bundle; Sahlin Studio December Days No. 2. Paislee Press Pocket Guides No. 2. Physical products used in this project: Paislee Press for Ali Edwards December Daily 2017 stamp set; rubber embellishments; word stickers. Ali Edwards December Daily 2017 Main Kit rubber embellishments; cork numbers; chipboard stars; felt hearts; 2015 December Daily Main Kit tickets; Story Kit plastic storage envelope. Crate Paper Falala collection chipboard Holly embellishment; Cute Girl transparency. Felicity Jane Joy kit Ho. Ho. Ho. rubber embellishment; white circle chipboard numbers; star shaped paper clip; wood number 10. Dear Lizzy Saturday collection wood number 4. Elle’s Studio wood number 11. Simple Stories Carpe Diem alphabet stickers in black and in green. Gossamer Blue clear alphabet stamp set. Amy Tangerine glitter foam title word. Pinkfresh Studio December Days die cuts. Miscellaneous: Target glitter tree tag; May Arts red velvet ribbon. These pages are just beautiful Theresa! 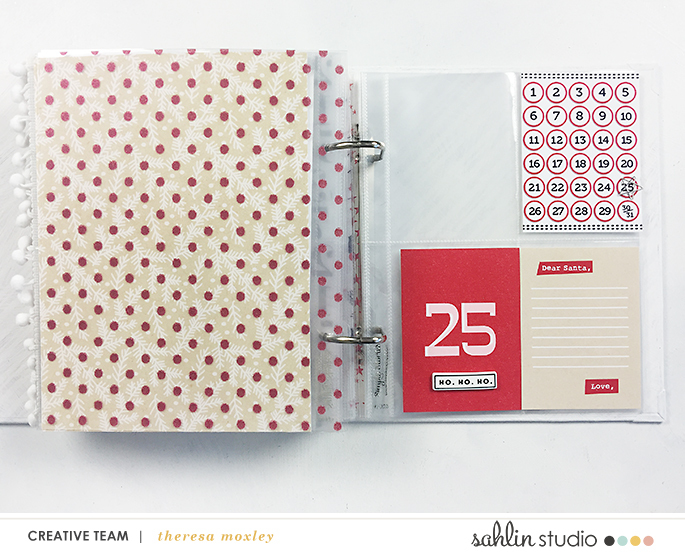 I especially love the vellum floral print page – so perfect with the minimal embellishments! Thanks for the inspiration!